From the seemingly hopeless to the almost perfect, you will learn how to master the timed essay in this guide to the SAT's writing portion. Based on the premise that timed writing is a skill that anyone can learn, this handbook breaks down the essay-writing process into an easily mastered regimen that includes brainstorming, writing an outline and time-management strategies. Thirty mediocre sample essays are analyzed, improved and scored to help you recognize what graders look for and understand how to improve your own writing. In a detailed question-and-answer section, top tutors and former SAT graders share their thoughts on what they like to see in an essay and give advice on creating the strongest piece. A basic overview of grammar and vocabulary and handy writing shortcuts are included. III: We're Gonna Make a WRITER Outta You! Part IV: Read It and Weep (and then Improve!) 30-40 example essays with boring/mediocre examples analyzed for errors and then improved. “A rare combination of verve and precision. 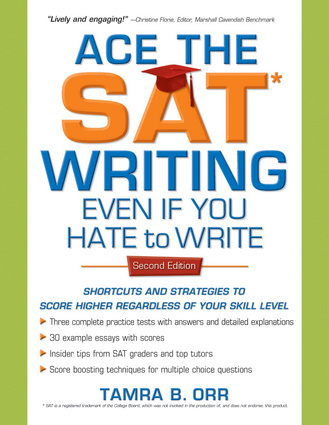 In this time of high-stakes accountability, Ace the SAT Writing Even If You Hate to Write provides an accessible way for students to get through the SATs. The author has an insider’s perspective on assessment having participated in all aspects of test development. She knows what the test writers are looking for because she is one of them. Her knowledge of assessment combined with her writing talents make this book a ‘must’ for students who want to help themselves and improve their test scores.